In 1870 St. Ann’s Catholic Church was the religious equivalent of a hermit crab – having successively taken over structures built by previous congregations. 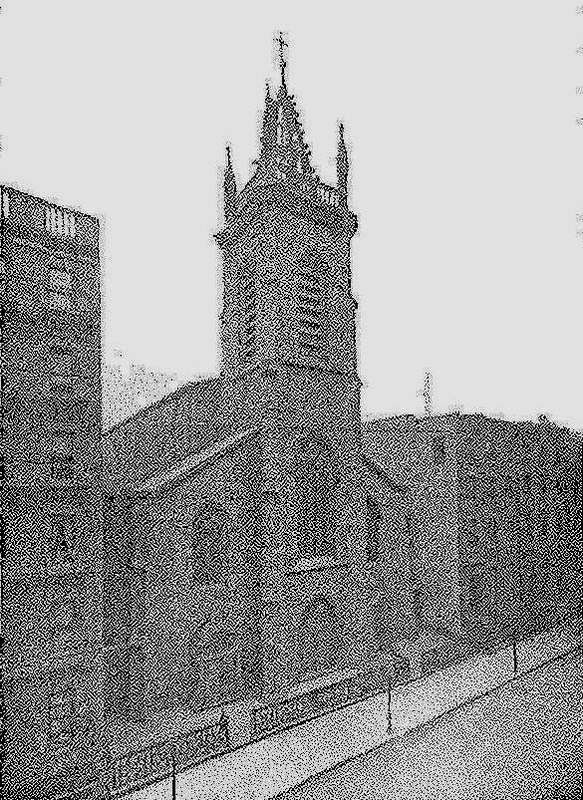 The parish was formed in 1852 by Bishop Hughes in the fashionable Lower East Side – the Bond Street neighborhood – with Rev. John Murray Forbes as pastor. Forbes secured a church on East 8th Street, opposite Lafayette Place, built by an Episcopalian group and later used by Presbyterians. “Its purchase by the Catholics gave rise to much comment," noted The Times. By the time the Civil War had ended, St. Ann had outgrown the building and also needed to build a school. Rev. 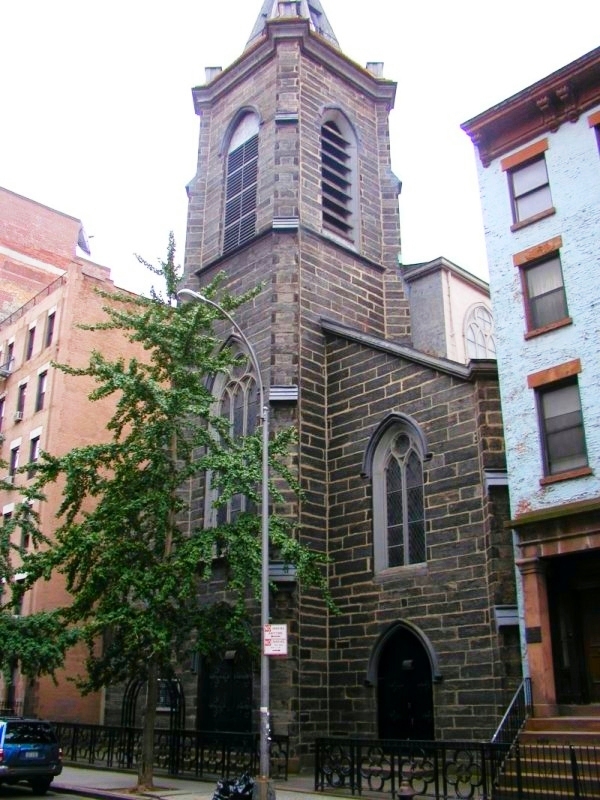 Thomas S. Preston, finding no suitable property in the immediate area, purchased the 1847 church at 120 East 12th Street. The 1914 edition of “The Catholic Church in the United States” maintains the church was built by Episcopalians while The New York Times maintained it was erected by Baptists. In either case, it was subsequently renovated into a synagogue, the Temple Emanu-El, before Preston acquired it. The land stretched through the block to East 11th Street, allowing for the construction of a school building. The church fathers had big plans for the structure. Saving only the 1847 façade and tower, they commissioned architect Napoleon Le Brun, who would become most remembered in New York for his elegant and fanciful firehouses, to demolish the main portion of the building and start over. Le Brun drew up plans for what The Times pronounced would be “in the pure French Gothic style of the thirteenth century;” 166 feet long by 63 feet, 8 inches wide. On Sunday, July 10, 1870 at 6:00 pm, the cornerstone was laid with great fanfare. A procession from the 8th Street church, headed by the 7th Regiment Band, marched to the construction site. There were 100 young girls in white dresses and veils, members of the Societies of the Blessed Virgin, the Men’s Society of the Immaculate Conception, the Young Men’s Society of St. Aloysius, acolytes, thirty clergymen, the Very Reverend Vicar-General (“dressed in a splendid cope”), and more. Inside the cornerstone was placed a box containing United States coins and currency, the names of the church leaders as well as national, state and city executives and a parchment history of the church. Within a few months the building was completed. 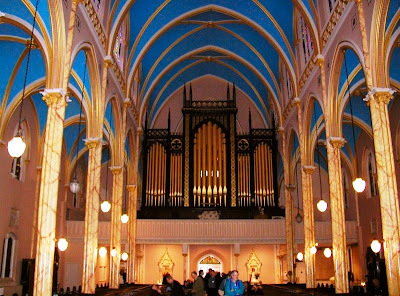 On New Year’s Day, 1871 St. Ann's Catholic Church was dedicated; The Times calling it “among the most beautiful and costly churches in this City.” The church, not including the land, cost a staggering $160,000. Inside, the altars and communion railings were carved marble and the gallery fronts and pews were constructed of chestnut and black walnut. Slender clustered columns rose to a soaring Gothic-groined ceiling. The church could comfortably seat 1600 worshipers with standing room for an estimated total of more than 2300. That moneyed reputation may have been what urged 26 year-old Robert Meldron, “a brutal-looking fellow,” to sneak into the church on a Sunday afternoon in February 1885 and break into the poor box, stealing $27.37 in pennies and small coins. Rather than make a fast getaway, however, Meldron hid in a confessional box and was discovered by the assistant sexton at 4:00 in the morning. The $27.37 did not cover his $1,000 bail. 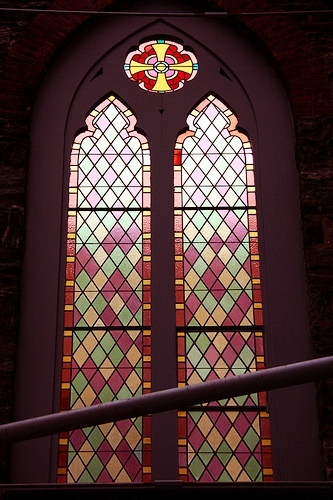 In 1920 French stained glass windows were added -- up-to-date, straight-forward designs in lush primary colors. The great treasure of St. Ann was its relic: a finger bone of the saint. After many years of possessing the bone, on December 8, 1929 a papal designation was handed down making St. Ann’s Church a shrine. Auxiliary Bishop Dunn celebrated a solemn pontifical mass inaugurating the Archconfraternity of the Motherhood of St. Ann. Just two years later, on July 24, 1931, the New York World-Telegram reported of the miraculous cure of the young son of Hugh F. Gaffney. The boy, who lived at 348 East 18th Street, was stricken with paralysis. The bone of St. Ann was brought from the church to his hospital bed at the Medical Center Hospital where, the newspaper claimed, after being touched with the bone, the invalid was cured. As the neighborhood changed, so did its ethnic make-up and in 1983 the church was re-established as St. Ann’s Armenian Rite Catholic Cathedral. 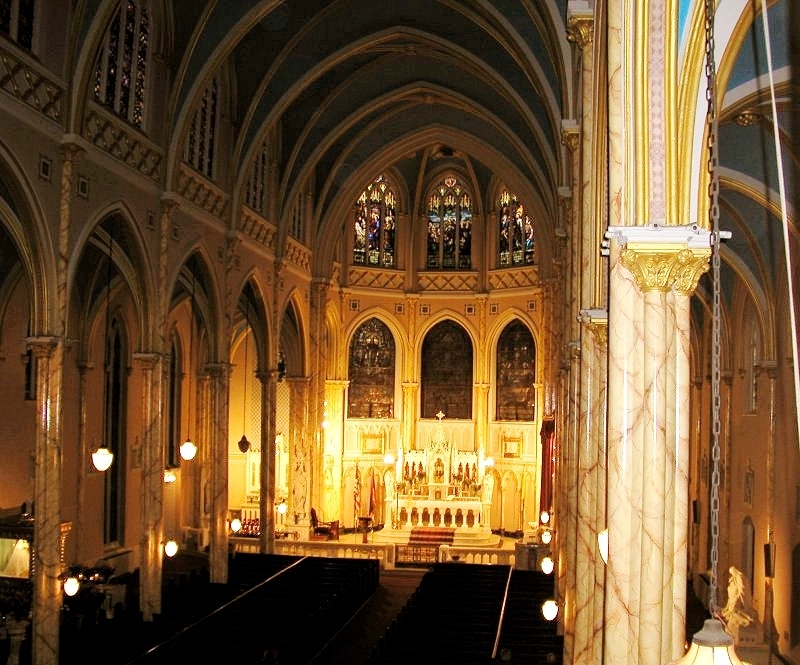 It was one of the three last Manhattan churches to offer traditional, pre-Vatican II, Latin masses. To the despair of the neighboring community and the parish, in 2003 the Archdiocese of New York announced it would close the church and sell the property. A year later the doors were locked for good. Pleas went to the New York Landmarks Preservation Commission to landmark the historic structure, but the Commission balked, sealing the fate of the century-and-a-half old church. Hudson 12th Development LLC purchased St. Ann’s for $15 million in 2005 and later that year New York University announced plans for yet another dormitory building; this one 26 stories tall. Despite protests by concerned citizens and the Greenwich Village Society for Historic Preservation, and despite NYU’s promise to integrate community concerns into the designs, in July 2006 plans were filed and construction started on what is universally panned as an eyesore. Referring to the controversy, Alan Bell, a principal with Hudson 12th, simply said that “the church was not landmarked and the space was fair game,” according to The Real Deal. In the meantime, the beautiful and notable façade of St. Ann’s Catholic Church stands in its shadow as a mute symbol of callous disregard for historic structures. Disgraceful and as much a testament to the apathy and incompetence of the NY Landmarks Preservation Commission which is corrupted by political self-interests, but it is also a sad reflection on today's diminished interest in preservation in general. An unfortunate historic loss for future generations plus a lasting statement to the poor quality of design by many architectural firms who are only interested in dollars as are the developers, in not in leaving the place better than what they found it in. Abysmal design at best. destruction? It's a shame they have lost that historical integrity. For St Ann's Records, see website for R.C. Archdiocese of NY, then Archdiocesan Archives. This leads to list of all parishes, including the names of the existing ones which retain the records of defunct parishes. For additional info, e-mail Archdiocesan archivist. I bought all the stained glass recently from a fashion mogul who had an office next door. Trying to get verification that the church was visited and blessed by Pope John Paul II. I plan on trying to restore the glass (it sat on the floor of a barn for years) or create art from it. Any help would be appreciated in tracking down this information. I also would like to know where the records from this church have gone. I believe my great grandparents were married here in 1908. Do you think any of the church records still exist? Thanks for the acknowledgement. Your post gives an interesting, different perspective to the issue and is well appreciated by everyone invovled, I'm sure. Where can one go to find school records from St. Ann's School? My grandmother may have attended it circa 1917. My mom's Armenian Catholic and I used to go this Church often as a kid and then a teen in the 1980's-'90's. I think what has gotten lost, and if my memory serves, St. Ann's as well as the rectory which was affixed to the church were asbestos laden. In fact, one of the last priest who decided to do a renovation project died of cancer due to it. Although I agree that the cathedral had significant historical value, it may have also been a public hazard.